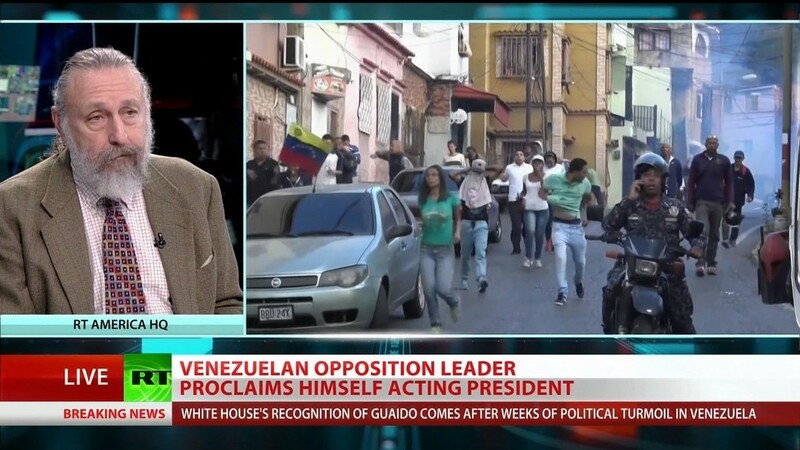 RT America’s Dan Cohen reports on the US-backed coup taking place in Venezuela. Manila Chan sits down with former US diplomat James Jatras to discuss the diplomatic impact of Venezuelan National Assembly President Juan Guaido announcing he is the country’s interim president. Former Pentagon official Michael Maloof analyzes Syria threatening to strike Tel Aviv after Israel had struck civilian areas. Then Manila chats with former UK Parliament Member George Galloway about the possibility of another Brexit vote and the Yellow Vest movement rising up in Spain. Zimbabwean protesters say they were systematically tortured by soldiers. President Donald Trump canceled trade talks with China. RT America’s Trinity Chavez reports on an alleged terror plot against a Muslim community in upstate New York. RT America’s Ashlee Banks tells us about drones stopping air traffic at Newark International Airport in New Jersey.